Whenever you call up your flight details using BA.com’s Manage My Booking (MMB), you may notice an peculiar code describing the aircraft operating your flight. It is usually generically marked as “320”, but can change to either 20A or M0A closer to departure. These codes can be quite useful as they allow you to narrow down the actual aircraft operating your flight. Exit rows 11 and 12 offer greater leg room but caution may be given to rows 10 and 11, as these seats do not recline. For a family of 4 LHR to FCO, any suggestions on the optimal Club Europe seating an A320? I'm thinking of paying for the seats as the flight as down the road, I don't want to get stuck in rows 3 or 6 with no air vent, and I want to maximize room. I was thinking 4DF and 5DF as the DF side is supposed to better than the AC side, correct? It's row 6 in some aircraft that have no air vent, I can see row 3 is in the wiki post marked as not having air vent but I don't think that's accurate (or it may be just one aircraft or something). Personally I wouldn't bother paying, it's not a long flight, and there is a fair chance of a switch to A319 or A321. If there are young children involved then you get seat selection before OLCI. DF and AC have identical room, the seats are bolted on to a lengthwise chassis so they are exactly the same distance apart. The only seats with more leg room are row 1 and the exit rows, which sometimes ends up in CE if ticket sales warrant it. Alternatively, so we're all in the same row- 2AC and 2 DF. I agree with CWS I wouldn't be paying for comfort outside row 1 or the exits, but as a family of four I think it may be worth paying for the whole row together. That's something you're less likely to get if you wait until OLCI (although possible). There is something nice about sitting as a row of 4 in CE where you can all see/smile/pull faces at each other across the aisle. Preferable to sitting 2 behind 2 in my opinion. No really young kids. Teenagers, but I'm thinking it's worth the 20 pounds per ticket for row 5 and beyond or 23 pounds per ticket for the first several rows so we can have an entire row. Do they always start service from row 1 (it's not available but row 2 is)? Do seat prices increase closer to the flight? Service always starts from row 1, I've never been on a BA shorthaul flight where that was different. Row 1 will be kept for Golds/Emeralds, it may be released at a late point. Seat prices are at their lowest at the point of initial ticket purchase, they then typically go up if buying later on, they sometimes come down but are not supposed to go below that initial price. The most usual scenario at OLCI that thanks to Theoretical Seating you will be offered a block together, particularly if you are on a reservation with an earlier sector (since you can check in earlier than point to point passengers) but it can't be guaranteed without payment, and it is more likely to be towards the back of the cabin - the curtain will be pushed back in line with CE sales. If it really isn't the end of the world if the teenagers are a row or two away from the parents then I would point out that £20 x 4 buys a lot of pizza. If it really isn't the end of the world if the teenagers are a row or two away from the parents then I would point out that £20 x 4 buys a lot of pizza. Yup, and if choosing to stump up then I'd say might as well go for row 2 which is then very near £100 for the privilege. Whether that's worth it is very much a question for OP. OK. Thank you both. On a 2.5 hour flight where we'll be on the plane for at least 3 hours, I think in the scheme of things it's probably worth it. 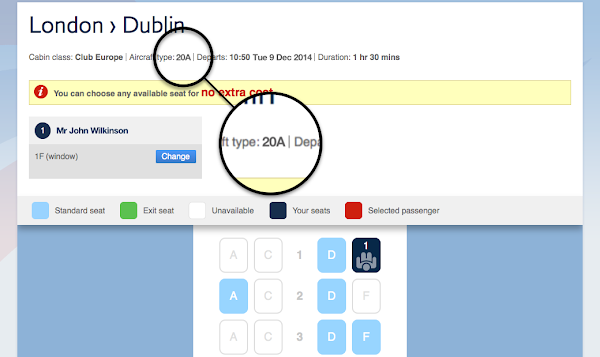 which gives seat selection for free on BA 7 days before the flight. I am booked to do LHR >> IST next month on one of these drab beasts (really going to miss the 767). I assume, at 4h, that it's not THE longest, but it is possibly amongst the longer sectors these serve. Any bright spots? No chance it gets swapped for some snazzy ex BMI bus I suppose??? Are the A320/1neo seatmaps online yet? I can’t see them on the seating Wiki. My next A320 is to BCN on a 320neo inbound. I suppose it doesn’t make much difference in CE anyway - other than the enhanced table. I've got my TP run to Catania tomorrow. As someone who usually wouldn't pay for CE, I have my first chance to sit in Row 1 on a G-GAT (i think) configured A320 since the demise of domestic on my regular Belfast route. Before the masses can check in later today, I can choose from 1D or 1F, I'm inclined to take F due to the window, but as someone who is quite tall (6.4"), would 1D be better? Basically can I practically/comfortably stick my feet alongside the bulkhead or will they just be in the way of the crew and mean I'm contorted sideways? I'm inclined to take F due to the window, but as someone who is quite tall (6.4"), would 1D be better? Basically can I practically/comfortably stick my feet alongside the bulkhead or will they just be in the way of the crew and mean I'm contorted sideways? If I was you I would get any Row 1 you can. Its impractical and probably a safety issue to have your legs in the aisle. The benefit of F is that you can lift the arm rest, sit slightly askew and use the fuselage a bit, although the legroom is reasonably good. Saying that, it doesn't allow you to stretch out your legs like in the exit rows. To me CE is not worth it if aside from row 1, and I would personally prefer to travel in the Exit rows as the leg room is excellent. If there is a 1D and 1F then it definitely is not a GAT. Thanks, but I don't think it's worth status matching just for this. I pulled the trigger and paid for the seats in row 2.